Palamós is a town on Costa Brava. It belongs to Girona, another Catalan province. Palamos is well known for its prawns but another delicacy that they are very proud of is their anchovies. Although presented in different ways, it is better to buy them bottled in brine. For me these are second best to L'Escala's famous anchovies also on the same coast. 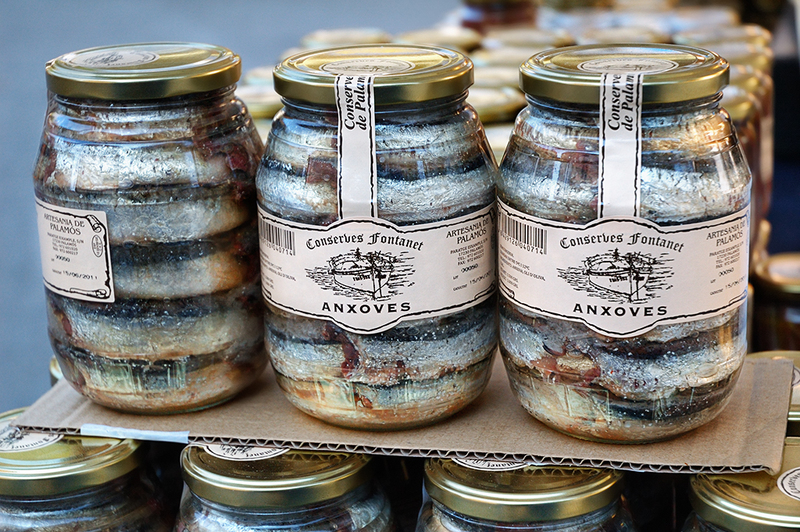 I found this wonderful article that explains every detail about this wonderful Catalan product: Anchovies from Spain. I hope this food article helps to grow an appetite. I have to say that the picture was taken in a local market in Barcelona. Carlooooos!!! Feliz navidad, he pasado a despedirme hasta el año entrante!!!. Recibe un abrazo de Navidad y año nuevo!!! Que tengas muy buenas fiestas!! ostres, quina gana que m'has fet venir ! -Feliz Navidad y Buen Año Nany. Que tengas un buen viaje, porque supongo visitarás tu tierra. Gracias! Thanks Rich, I have enjoyed reading that excerpt from your book. Nice approach.